← Home Is Right Here! Matilda Croxe Stevenson, Ethnobotany of the Zuni Indians. G. Jung, Memories, Dream and Reflections. Old New Mexico Highway 666 branches off from Interstate 40 and heads north out of Gallup, through desolate, wind-carved red sandstone canyons toward the Navajo and Hopi people. Clusters of white crosses pop up at each tight turn, roadside memorials marking violent auto deaths, many due to drunk driving. I had heard about the Indian Swap Meet and our family put it on our bucket list during our RV camping trip in New Mexico. I searched for the highway, and did not have to look for long as I could see a line of cars parked on the road. Here is the swap meet. Across the street large flatbed trucks sold bales of hay directly into waiting pickup trucks. Small corrals displayed sheep, goats, and saddled horses for sale. We followed the Navajo, Zuni and Hopi families as they moved toward three long aisles of tables and booths, which we would walk for almost two miles. This was a family affair. Grandmothers, wearing traditional long red and blue velvet dresses with heavy “old pawn” bracelets and necklaces, held on to grandchildren as parents browsed through auto parts, computers and fresh fruit and vegetables. This was an amazing place. Small booths with tables of hand-made jewelry with real turquoise, not the reconstituted turquoise powder mixed with plastic found in the tourist shops. An aromatic cloud hints of mutton stew and homemade lamb sausages. Fry bread made to order or filled with lamb and beans as the Navajo Taco. CDs play singing and drumming from Indian ceremonies. Handmade Navajo dolls, including a striking scenario of a Navajo woman kneeling at a loom with a half-finished rug. Then I saw it! the table covered with herbs for healing. The Navajo Spiritual Pharmacy. 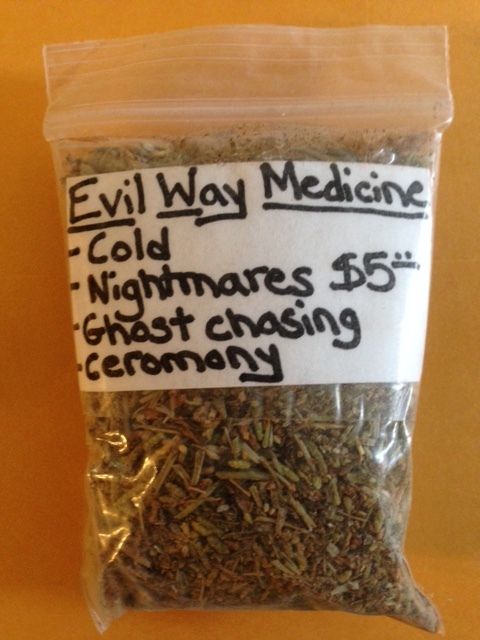 “Evil Way Medicine: cold, nightmares, ghost chasing ceremony”. I picked up that bag but hesitated asking how it is used. The Navajo lady looked at me as if thinking, “you don’t know what you are dealing with.” Next to this item were tiny bags of fine, yellow corn pollen: pure, concentrated spiritual energy. I bought both to use in the world religion class I teach. 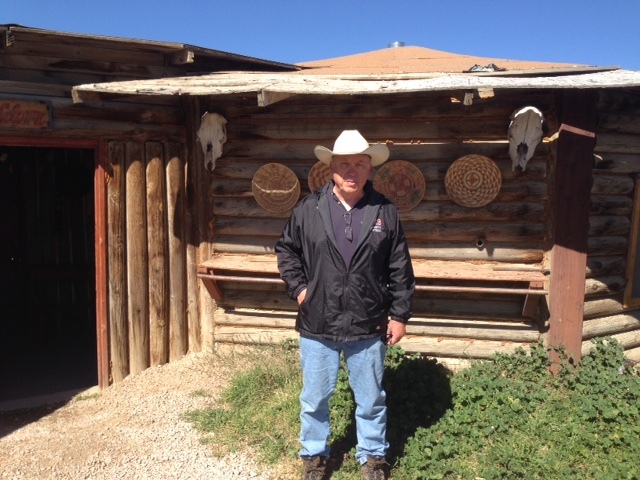 In our four-week visit to sites within the Navajo reservation, I had some conversations with tribal individuals. However, when I asked questions about the use of various herbs in healing ceremonies, responses were vague and dismissive. This is not a pharmacopacia like the Physician’s Desk Reference for Herbal Medicine. Only the few Navajo who had gone through extensive training under a medicine person hatali would have this information. Sacred information is diluted in power when too many people know. As we travelled through the reservation lands covering four states, we gazed in wonder at the vast red sand landscape where the weather is harsh with sudden changes. On one trip from Santa Fe to Gallup, we saw a car blown off Interstate 40 and a freight train of empty containers derailed by powerful winds. We awaken one morning, dressing in shorts and t-shirts. However, after lunch, crossing the Continental Divide near Gallup, slushy snow covered our windshield. Parched, arid land suddenly drenched by monsoonal rains, dry washes where we hiked yesterday now flowing in violent flash flood. Nevertheless, Nature cannot match the sudden changes of modernity invading the Navajo reservation. Elders lament the loss of traditional ways, as Dine’ youth dress as gangsta wanabes with bright colored Nike shoes. Traditions continue, including the gathering of wild plants for medicine and ceremonies. The Diné spiritual world centers on the bond of living and inanimate things. Plants are not picked indiscriminately, but for a specific purpose. For example, if sage is needed for healing for cold or flu, the Herbalist offers a prayer to the plant expressing why it is needed and an offering of a pinch of corn pollen may be sprinkled over the plant. This indigenous desert world is fragile and unstable, in constant process of deconstruction. Dark forces of witches and skinwalkers lurk in the shadows. The Hatali or medicine man/woman have the power to restore harmony, balance, Hozhó (beauty). Through hand-trembling, incised rocks or crystal rocks, the halati tries to diagnose the cause of the illness. “Dis-ease” always has a spiritual cause: violation of a taboo, such as a protected animal or a dead person. Healing chants can be as short as a few hours or last for several days. Navajo soldiers who left for military service in Iraq and Afghanistan received a Blessing Way Ceremony, as they would be beyond the protective enclosure of the four sacred mountains. Soldiers who returned from war, with PTS syndrome needed the Hatali to perform an Enemy Way Ceremony, as a kind of exorcism from the pollution of evil in the body and restore Huzhó. The bundle of herbal medicine I purchased at the swap meet is a cure for curses pronounced by skinwalkers and witches. There are about sixty Diné healing ceremonies, many of which last for more than four days. Because the hatari is a kind of healing magician, the ritual must be performed precisely correctly, with the help of the constant attention of family members. Health for Native Americans is giving constant attention to harmony of mind, body and spirit in a world of dark forces, which can cause sickness through pollution. The context of this hard work of balance and harmony is in the created world, where all animate and inanimate entities are spirit presences that can help or harm us in our journey toward wholeness. Herbal medicine is at the heart of this process of healing and harmony. Sage is a common and powerful herbal aid. It grows almost everywhere. It protects against evil spirits, often used in exorcisms and daily protective purification. Sage is a common cure for colon, stomach, sinus, and colds and fever. Medicine men carry a medicine bundle. The contents are uniquely personal, which may hold healing stones and crystals, fetishes and corn pollen and pipes, whose sacred smoke carries prayers to the spirits. Until recently, traditional medicine was the only help available to Diné. If you visit the Navajo Health Center in Window Rock, AZ, you will see that the concept of spiritual harmony is deeply impeded within the modern concrete walls with all the modern medical equipment and training. Kai (Willow Tree) Totsonnie, of the Big Water Clan, is six feet tall in her bright orange Nike shoes. Luminescent black hair flows down her back to her leather belt. Her height and large hands remind me she was a member of the 2004 Ganado High School Girls’ Basketball team that won the Arizona state championship. We follow her as she walks intentionally through sagebrush and mesquite looking for the earth medicine. She tells us how her grandmother tutored her for most of ten years in the ways of healing with herbs and prayer. Alice Henkel reveals how the preparation of herbal medicines happen. Annual plants have their roots dug up in April/May; Perennial herbs were harvested in October/November. This is when the medicinal properties of the plants are most potent. The plants are washed or shaken; they can be hung from rafters out of the sun to dry for later use or used right away. We walk around cholla cactus, which seems to lean toward us, trying to snag our clothes. The sagebrush and creosote are wet from last night’s rain and emit pungent perfume. I sheepishly pull out a colorful folder: “A Pocket Naturalist Guide to Medicinal Plants.” Vivid photos of plants include description, habitat and disease for which they are remedy. I show it to Kai, expecting chastisement. Our time together is drawing to a close. The crimson cliffs around us darken, as the sun sets behind the White Mountains. This transition between day and night is when dark spirits and witches lurk in shadows, seeking the weak and vulnerable. Shrieking sage hens suddenly leap into the air from dense salt brush. The face of a coyote peers between the brush and disappears. A few minutes later, I see a small, brown-skinned. shirtless man running away into a dry wash.
“Skin Walker,” Kai sighs. I hear humming, soft singing. Her lips move in quiet prayer. I want to mindfully learn more about these desert plants, through which I have marched intently in the past, focusing on some distant goal, stomping unconsciously through the dense brush. This landscape is alive with healing and blessing. These are not dry, useless weeds, but living gifts implanted by God for healing and harmony. Nanise’ : A Navajo Herbal, by Vernon Mayes and Barbara Bayless Lacy. Detailed narrative of 100 plants found on the Navajo Reservation: the name of each plant and how the plant is used in healing. Singing to the Plants: A guide to Mestizo Shamanism in the Upper Amazon, by Stephan V. Beyer, University of New Mexico Press, 2010. Earth Medicine Earth Food, by Michael A. Weiner. The classic guide to the herbal remedies and wild plants of the North American Indians. A Pocket Naturalist Guide to Medicinal Plants, Kavanagh/Leung, Waterford Press, Inc. This entry was posted in Blog and tagged Dine, ethnobotany, ethnomedicine, Ganado Arizona, Hatali, Husho, Nanise, Navajo Herbal Medicine. Bookmark the permalink.